I’m just now catching up on my backlog of posts so here’s a trio of sketches from recent Drink ‘n Draw sessions at Anyone Comics. 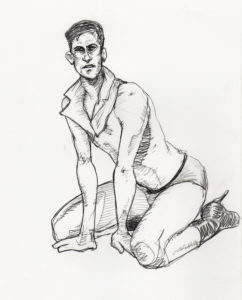 Anyone Comics hosts weeknight D’nD Life Drawing sessions at the store from 7:30-10:30 pm every other week ($15 cover). “Gio” – ink and wash.
“Donato” – pencil with gray marker.